You probably haven't heard of any of them...which is why they are such great opportunities. If there's one refrain investors have heard over the past month, it's that we shouldn't get used to the types of substantial returns we experienced last year. Indeed, returns like those from the Nasdaq Composite were the third-highest since the turn of the millenium. But that doesn't mean that all the "good deals" have dried up. 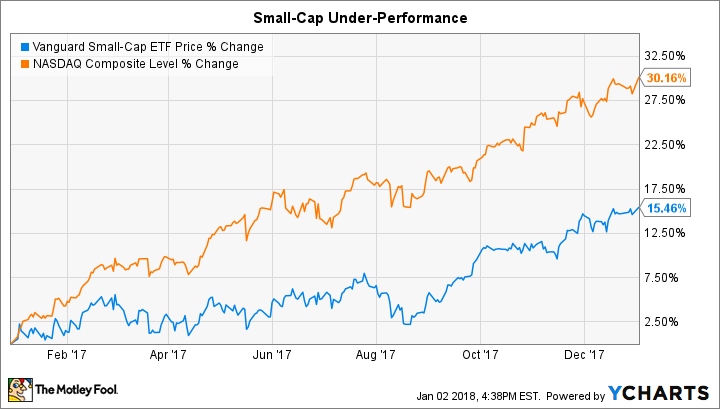 In fact, if we look at the Vanguard Small Cap ETF -- which includes over 1,400 stocks with a median market capitalization of $4.2 billion -- we can see that this subgroup only produced half of what the Nasdaq did in 2017. That's one of the reasons I'm excited to introduce you to five small-cap stocks that have the potential for huge growth in 2018 and beyond. You probably know Axon Enterprises (NASDAQ:AAXN) better by its former name: TASER International. The company still makes the stun-guns that are used the world over, but last year management decided to make a very public pivot toward police body cameras. Not only did the company's name change, but Axon decided to give away body cameras and a year's subscription to Evidence.com -- a platform for storing and analyzing police footage -- absolutely free of charge. Obviously, that's put a serious dent in short-term profitability. Combined with a snafu in communicating with regulatory bodies, it has made some investors squeamish. But we are quickly approaching a time when some of those free one-year contracts will be coming to an end. While Axon has had negative free cash flow of $20 million over the past twelve months, it still has a balance sheet that sports $94 million in cash and investments with no long-term debt to speak of. Subscriptions to Evidence.com will start adding more to both the top and bottom lines soon. And there's reason to believe that revenue will be around to stay: not only are switching costs very high if a department chooses another cloud provider to store such critical data, but Axon's AI efforts are helping to cut down dramatically on time devoted to record management -- freeing up cops to actually focus on serving and protecting. Most shareholders of Ellie Mae (NYSE:ELLI) view slowing volume of mortgage refinancing with a furrowed brow. That's because the company -- which provides the Encompass platform to connect mortgage professionals with lenders, title companies, insurance providers, and financiers -- relies on refinancing volume to add to the top and bottom lines. That helps explain why shares are down 20% since May 2017. But it also presents an opportunity to gain long-term market share. Any company looking to offer a similar product in the highly fragmented mortgage market would have to be willing to endure slow times as interest rates -- and thus mortgage rates -- are expected to rise in the year ahead. That leaves Ellie Mae alone in this sandbox. And yet despite the refinancing slow down, the number of seats booked on Encompass has continued to grow, adding 9,600 seats in the second quarter and 8,100 in the third. Once these users are in the Encompass ecosystem, switching costs are high. Not only does leaving the platform mean abandoning the network of related professionals who can provide assistance in bringing a loan to fruition, it also means the headache of having to retrain your entire staff on a new operating system. That's why I think long-term investors who can stay in the stock until the next megacycle of home buying and refinancing hits will be richly rewarded. Chad Richardson used to work for payroll giant ADP. What he learned there -- and at other, smaller companies in the industry -- was that certain needs weren't being met, and utilizing the cloud could not only help fix that, but do so in a highly profitable manner. That's when he decided to found Paycom Holdings (NYSE:PAYC). Beyond payroll, the company offers a full suite of HR-related solutions: talent acquisition, time and labor management, talent management, and even compliance with COBRA, 401(k), and healthcare benefits. All of those buckets mean that once a small or medium sized business (SMB) signs on with Paycom, switching costs are high. These SMBs don't have the time or money to switch to another provider, and would rather devote their time and energy to fulfilling their company's mission rather than onerous HR tasks. It's increasingly obvious that the value proposition offered by Paycom is catching on: not only has revenue increased by 30% or more since 2013, margins are improving as the company gains operating leverage. If you're following along, every company so far is a Software-as-a-Service (SaaS) provider. By that, I mean that these companies develop software for other companies to use, then deploy it via the cloud with a very light capital structure. Operationally, this is a huge cash cow: overhead costs are low, upgrades are installed with the flip of a switch, and wide moats are provided by the high switching costs described above. The next stock on the list, AppFolio (NASDAQ:APPF), fits this model to a tee. The company provides software to help both legal professionals and property management companies run smoother operations. A landlord can handle everything from leases to maintenance, while law firms can track billings and case management, and all on a single platform. There are two big factors that make me excited about AppFolio's prospects. First, it is winning customers hand over fist. In 2014, the company brought in $48 million in revenue. Fast forward to today and AppFolio has generated $134 million in sales -- a compounded growth rate of 45% per year. At the same time, it's clear that switching costs are high, as customers not only stay with the company but purchase more value-added -- dubbed "Value+" by the company -- services as time goes on. Management publishes a "dollar-based net expansion rate" (DBNE) annually, a measure of whether customers stick around and/or add more services. In 2016, the property management division had a DBNE of 113% and the legal division was at 99%, both indicative of a wide moat business. Back when it got its start, Bitauto (NYSE:BITA) was focused on helping car dealers in China set up virtual showrooms to attract customers via the Internet. That business is still going strong today, but it's a recent offshoot that really has me excited. Starting in earnest in 2015, Bitauto set up a subsidiary -- Yixin Capital -- that would facilitate auto purchases. While many of the loans were self-financed, Yixin also focuses on connecting auto dealers and customers with third-party financiers as well as insurance agents. Business in the segment has been through the roof: Bitauto's transaction services revenue -- most of which flow through Yixin -- has increased from $99 million in 2015 to over $470 million in the past year. The promise is evident enough that several Chinese tech titans have invested in Yixin as well -- including Tencent, JD.com, and Baidu. But Bitauto retains a 44.4% stake in Yixin, which recently went public on the Hong Kong Exchange. Currently Yixin alone is valued at $5.55 billion, which makes Bitauto's stake worth $2.46 billion. But Bitauto -- traded on the New York Stock Exchange -- has a market cap of just $2.39 billion as of this writing. That means that by purchasing Bitauto today, you're getting Yixin for a 3% discount, and all of Bitauto's other businesses absolutely free! I personally own four out of these five stocks, and plan on beginning a position in AppFolio in the coming months. While all five of these stocks have relatively expensive multiples -- none trades for less than 45 times trailing non-GAAP earnings -- they all have enormous opportunities and growing moats surrounding them. Small cap stocks inherently have a lot of room to run, and I think a basket of all five could prove lucrative for 2018 and beyond.